The First ﻿Youth Peace Ambassadors Workshop was held in Hiroshima, Japan, from 9-13 October 2010, with cooperation between UNESCO, Eubios Ethics Institute, Hiroshima Peace Culture Foundation and UNITAR. there were over 50 participants. The Second ﻿Youth Peace Ambassador Training Workshop was held in Phnom Penh from 28 March to 1 April 2011, with cooperation between RUSHSAP at UNESCO Bangkok, Cambodian Institute for Cooperation and Peace (CICP) and Eubios Ethics Institute. There were over 60 participants.﻿ It is at this occasion the first Youth Ambassadors were recognised. The Fourth ﻿Youth Peace Ambassador Training Workshop was held in Hiroshima and Etajima from 24-31 March 2012, with cooperation between RUSHSAP at UNESCO Bangkok, Eubios Ethics Institute, Hiroshima Peace Culture Foundation and UNITAR﻿. 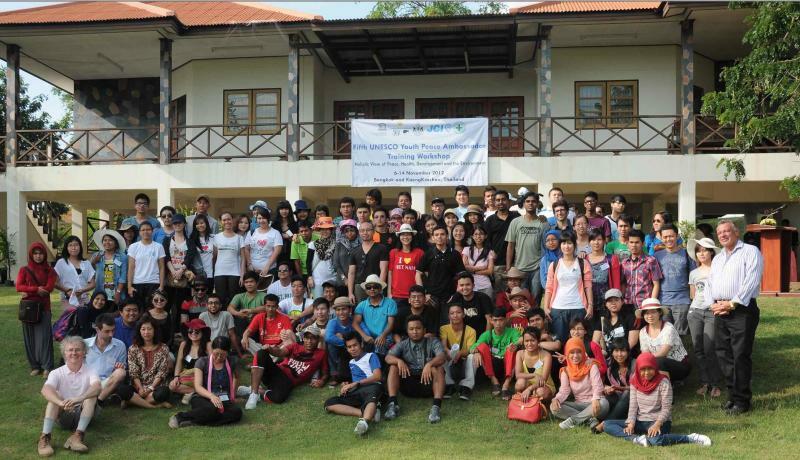 The Sixth Youth Peace Ambassador Training Workshop (YPA6) was held in Bangkok and Kaeng Krachan from 27 May to 2 June 2013. The Youth Peace Ambassadors Festival at Chulalongkorn University was held from 21-27 May 2013; overlapping with the YPA6 from 25 May - 2 June 2013. See details for YPA13, YPA14, YPA15 and YPA16 on the pages above! Pictures of the trees planted at the International Peace Park at YPA5, and the names of the persons who planted them are here. For more information read about the new Centre. The Olympic Youth Peace Ambassador Training Workshop was held in London, UK, 31 August - 9 September, 2012. Japanese Youth Peace Workshop: Bioethics for the Future, 27 August 2013. Venue: United Nations University Institute of Advanced Studies (UNU-IAS), Yokohama, Japan. Organizers: Japanese Youth Peace Ambassadors, Eubios Ethics Institute, American University of Sovereign Nations, UNU-IAS. ﻿I Dream of Peace hosted by Youth Peace Ambassadors from Concordian International School, Bangkok, Thailand on 21 January 2011. Educational Peace Fair hosted by Cambodian Youth Peace Ambassadors in Phnom Penh on 29 January 2011. Youth Peace Fair and Peace Art Competition hosted by Cambodian Youth Peace Ambassadors at Pannasastra University in Phnom Penh on 2 April 2011. The Colour of Peace hosted by University of Canberra, Australia on 4 June 2011.
International Youth Day celebration in Manila, Philippines from 3-7 August 2011﻿. Click the individual pages above for more details! of past events. Be prepared to become a person to bring about real peace in our world! There will be other YPA events please watch this space! Those who seek YPA or LBD training can join intensive courses at AUSN that are held throughout the year. Participants committ themselves to develop and implement action plans, and those who complete become Youth Ambassadors. You can also find more on the Facebook site. Join Youth Peace Ambassadors on Facebook for updates.